Speaking of attractions in Las Vegas is talking about neon lights and entertainment. The Downtown is a faithful representative of the spirit of the city. Also known as "Glitter Gulch" and is known for their bright neon signs and bright lights million. 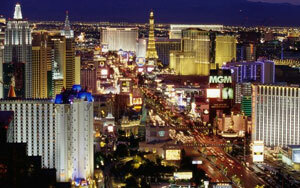 Las Vegas, has different neighborhoods, residential and Las Vegas Boulevard, Las Vegas Strip, among others. In the center of the city, there are the casinos, connected by underground passages, like the Caesar Palace, which looks a Roman temple, until it becomes a skyscraper, the Excalibur, a medieval castle-like, the Stratosphere, Paris, the Eiffel Tower, Arc de Triomphe, the Treasure Island, with shows of pirates and mermaids, MGM, New York, New York, the Luxor pyramid shaped, among others. Las Vegas is a paradise for gamblers worldwide. Several trips to do in this city and its great attraction are the casinos, like the Imperial Palace Auto Museum, the Hoover Dam on Lake Mead, the two guns in the area, the Red Rock Canyon, and Grand Canyon Colorado. Several restaurants, a typical American cuisine, china, india, etc, country music, what you look for in entertainment and shows are here. A city that never sleeps. "New fun stuff to do in and around the USA". Research from Mobilecasinoparty says playing real online casino games for cash is becoming more common. They are accessed by phones and instant play, instead of downloading the program and installing it. The online casino is enjoyed straight away anywhere in the USA and Las Vegas. Fremont Street is the place chosen by more than sixty restaurants, ten casinos, bars and intrepid vendors. Every night, great sound and light show takes over approximately five blocks. If you go, no doubt, know the essence of Las Vegas. The show starts at 20.30 and takes place every hour between 21.00 and 24.00. It is one of the main attractions can be enjoyed with the whole family. Located at 425 Fremont Street. You can reach by bus 301 or 302; Las Vegas Strip Trolley (tram) and admission is free. The main attractions are the casinos. You'll find the newest and largest casinos, the famous miniature theme parks. Bellagio Hotel (Theme: Italy): It is billed as the finest hotel in town. He was named in honor of the beautiful village of Bellagio's Tuscan architecture and much of its decoration was made with Italian Murano glass. Attractions: Sources dancers, flower garden, Cirque du Soleil. Caesars Palace Hotel (Theme: Ancient Rome) is one of the most famous hotels in Las Vegas due to its comfortable and luxurious rooms, plus spectacular shows featuring world renowned artists attractions: living statues, aquarium, shows permanent Celine Dion and Elton John. Mandalay Bay: One of the largest and most luxurious hotels. Located on the top is the Four Seasons Hotel offers all the amenities and also has the best view of the city. Attractions: Artificial beach (with sand of Cancun). Venetian Hotel (Theme: Venice): Shows by artists like opera singers, mimes and characterized with Renaissance costumes inside the hotel in a simulation of the Piazza San Marco in Venice. Attractions: gondola rides. Treasure Island Hotel (Theme: Pirates): Hotel offers a sophisticated environment. He has received the AAA Four Diamond Award given by the best service. It is connected by rail to the Mirage Hotel. Attractions: Sirens vs. Show. Pirates, Cirque du Soleil - Mystere. Excalibur Hotel (Theme: Middle Ages): Its architecture resembles a beautiful English castle of the Middle Ages where they represent shows with battles for the throne of King Arthur, knights, dragons and Merlin the Magician. Attractions: Medieval Tournament of Kings show. Hotel Luxor (Theme: Egypt): Perhaps no other hotel in the world has looked so grand and mystical as the Luxor. This place is home, in a black glass pyramid 30 stories high and two massive towers, the splendor of ancient Egypt and all the technical wonders of the modern world. Attractions: IMAX screen, Recreation and Museum of the Tomb of King Tut, Blue Man Group Show. MGM Grand Hotel (Theme: Cinema): Your name (Derived from the MGM Film Company). The atmosphere in all its facilities refers to the film and the Lion symbol of one of the most successful film companies: MGM. Attractions: The Lion in the wild, Cirque du Soleil - Ka. Hotel New York (Theme: New York): This hotel features a scale replica of the famous Statue of Liberty and Brooklyn Bridge and inside the Times Square Avenue. Attractions: Coyote Ugly Show, Cirque du Soleil - Zumanity, ESPN Zone. Hotel Paris (Subject: Paris): Framed by two of the most representative symbols of the beautiful 'City of Light': the Eiffel Tower and the Arc de Triomphe the hotel maintains the classic Parisian atmosphere. The 85,000 square foot casino is adorned with fountains and statues, and the legs of the Eiffel Tower slip through the vaulted ceiling. In addition, the tables are located under the arches of the subway station faithfully reproduced Art Nouveau style. Circus Hotel (Theme: Circus): Here is one of the most spectacular and bright casinos. The décor makes guests feel like they're in a circus in which, consistently, there are acrobats, mimes, acrobats and carnival rides. Attractions: Grand Slam Canyon Dome. Hotel Mirage (Theme: Selva): Just enter this legendary property, visitors hear the soothing sounds of waterfalls, smell the aroma of exotic tropical flora and stand on the bridge of glass atrium 90 feet high for enjoy the tropical atmosphere that surrounds them. Attractions: Volcano - Volcano erupts, Secret Garden and Dolphin. In Las Vegas is not all play, you can also come to places like the Museum Las Vegas Art Museum considered the most important elite arts of Southern Nevada or the Natural History Museum in Las Vegas. Another site is incredibly distinguished you purchased the casino mogul Steve Wynn, known as Wynn Las Vegas opened its doors in 2005. There you will have a showroom for more than two thousand people, championship golf courses and thousands of rooms. If you want some action you will find on Fremont Street and The Fremont Street Experience. This street is one of those chosen by tourists as they are favorite sites. During the night all the places provide pure adrenaline. It is located in downtown near the Plaza Hotel. The main attraction of Las Vegas nightlife. The casinos, restaurants and bars are full of tourists from around the world. The most fun places for entertainment are the nightclubs, discos and premises that provide live music. In the Downtown you will find smaller sites, but more fun, while in the Strip are the big resorts that offer a wide variety shows or alternatives to relax. If the desire is to go to dance clubs are the ideal place. The entry has a value between U.S. $ 10 and U.S. $ 25, although in some, women are free. For alcohol, the minimum age is twenty years. Major hotels have numerous discos, but you can also enjoy the night at different bars that houses the city, offering a wealth of original entertainment. On the other hand, if you prefer to delight in live music, there are places that host the superstars of the song. The landscape of Las Vegas is desert, almost no vegetation and no large parks and gardens offered by other cities. However, you can enjoy great buildings that recreate spring water or wildlife habitat, as well as the Botanical Garden belonging to the University of Nevada Las Vegas. The Springs Preserve (333 S. Valley View Blvd) is a cultural and historical attraction, which was built in ancient times where there were water springs, which were dried in 1962. The Grand Canyon, one of the natural wonders of the world is undoubtedly the most important natural attraction when traveling to Las Vegas. His visit is a must. Of course, keep in mind that is more than 150 kilometers and it will take about four hours to arrive.